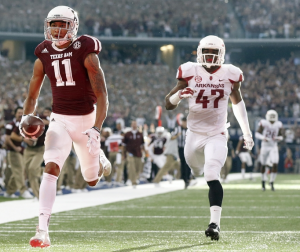 Below you will find the full analysis of Will DeWitt’s final Bears Mock Draft. Adams has been going to the Bears in 75 percent of my mock drafts. Why? Well, to put it simply, it’s his drive and determination. He inspires teammates, elevates their play and sets the standard. Adams, coupled with freshly signed Quintin Demps, would be a vast improvement from Adrian Amos and Harold Jones-Quartey. Adams is well-versed. He can cover in zone, man, and has the ball skills to create turnovers. He’s a reliable last line of defense. After Demps’s time is up, it would be Adams who would lead the secondary. He is the next Eric Berry. 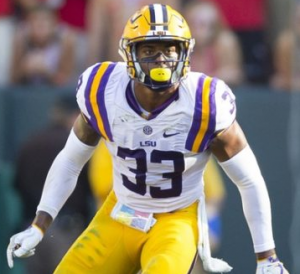 He will be a household name, and if the Bears take him with the third pick, Adams would be the next great Bears safety since Mike Brown. This is the highest that I’ve had the Bears taking a quarterback. This is due to the ever-increasing talk that Chicago will select one in the early rounds. Jon Gruden said he wouldn’t use a first round pick on Kizer, and I think that’s starting to become the consensus throughout the league. If the quarterback is still on the board at Number 36, I think the Bears have to pull the trigger on the prospect out of Notre Dame. 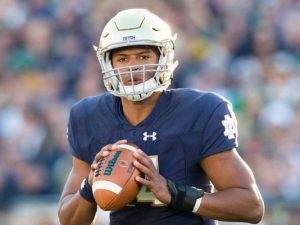 There would be no rush for Kizer to play. He can sit behind Mike Glennon for a season (or two) and take over after he grows both on and off the field. 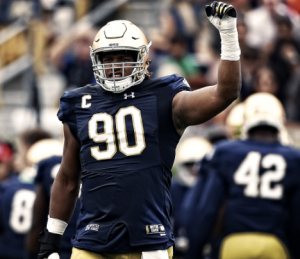 He’s a big-bodied, athletic passer that reminds people of Steve McNair. With some time to work on his ball placement and field vision, Kizer should be after to take over after Glennon’s stint in Chicago is complete. Another interior lineman might not be the biggest need in the third round, but if Feeney is still on the board my gut tells me Pace snags him. 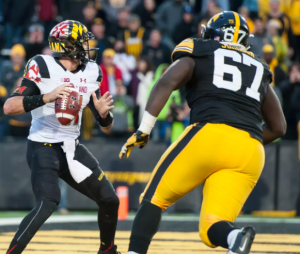 He was the most impressive blocker for the Bears-coached North Team at the Senior Bowl, he’s drawn comparisons to Cody Whitehair, and the Bears met with him last week. Oh, did I mention he paved the way for Jordan Howard at Indiana back in 2015? 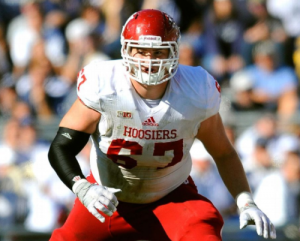 He’s also stout in pass pro as he only gave up two sacks in 3,355 snaps at Indiana. By drafting Feeney, the Bears could opt to slide Kyle Long back to tackle, but I’m unsure if that’s a wise decision. Instead, they could use Feeney as depth until Josh Sitton’s tenure is complete. He only has two seasons left on contract and is on the wrong side of 30. Drafting Feeney would give the Bears a plethora of options, all of which would improve the team. Johnson is back! The Hawkeye was in my first mock draft, but this is the first time he’s been included since. Although he grew up in Brooklyn, he moved to Chicago for high school. Returning to the Windy City, Johnson is an active player with a high motor. He’s quick off the block and maximizes his length while shedding blocks. He earned first-team all-conference honors in 2016 as he led the Hawkeyes with 10 tackles for loss and 7.5 sacks. Johnson would provide instant depth across the Bears’ defensive line and would be in contention to start next to Eddie Goldman. Reynolds is the only player to have made all four versions. He’s an explosive playmaker, and you can’t have too many of those. The Bears have already brought in speed by signing Markus Wheaton and Kendall Wright. So, why not add more? I’m a big fan of Reynolds. He finished last season with 61 catches and 12 touchdowns. He is a dangerous vertical threat and would help the Bears stretch the field. He also dominates in the red zone and would be an excellent option in this offense. Not knowing how Wheaton, Wright and Kevin White will pan out in 2017, the Bears would be wise to invest a draft pick in a young playmaker such as Reynolds. The Bears get playmakers back-to-back. Hikutini had a really strong 2016 season. He finished it with 49 receptions for 656 yards and eight touchdowns. He’s a dangerous threat that moves well in space and has the speed to attack over the top of linebackers. 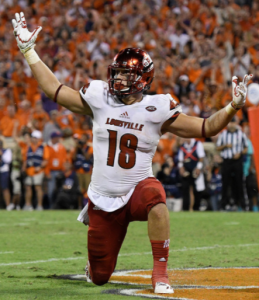 Hikutini does need to improve his blocking in order to become a legitimate NFL tight end. That said, there’s no rush for him to play with Zach Miller and Dion Sims atop the depth chart. Hikutini can be a sleeper pick in the fifth round. Trying to predict who a team would select in the seventh round may as well be pointless. There are just too many variables at play. That said, there is an outside chance that Rochell is still on the board in the final round, and if he’s there when the Bears are on the clock, I believe he would be a great fit. He has a high motor and should provide value to the Bears’ rotation at defensive line.